Wooden floors are used across London. They’re present in flats, houses, and bungalows as well as every public building and business available. They speak of high class and retain a connection to the past. Maintaining and preserving their beauty is an important job – one Great Floor Sanding is proud to take on and continue. Choosing our wood floor sanding service in London is a commitment to quality work and an exquisite aesthetic. 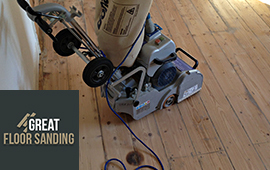 What Makes Our Wood Floor Sanding in London Special? Most wood floor sanding services rely on pre-written quotes based on measurements and general information over the phone. We recognize that each wooden floor is an individual that needs to be seen and understood before we can do any work on it. You’ll be visited by a team of experts to make notes of the wood’s condition. It’s this exceptional attention to detail that gives our wood floor sanding service in London its premier place on the market! 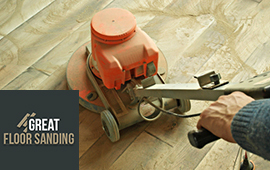 Great Floor Sanding has worked with multiple clients over the years. You can call us for every floor type – hardwood, softwood, parquet and even cork. We’ve done work for private residences, small businesses like stores and cafés, but have also worked in universities, school facilities and libraries. We understand how the floors have to enhance the room and it’s this experience that we bring on every single project. You can take a look at our comprehensive Gallery Page and see some of the most recent floor sanding jobs. What Sanding Your Wood Floors Entails? Although we refer to the service to sanding, there is far more than that. Let us give you a short walkthrough of the process as the premier wood floor sanding company. Restoration and replacement: Certain segments can be beyond sanding, which is where we come to save your floors. The experts find the perfect substitute for the damaged floorboard and fit it to match the current pattern. 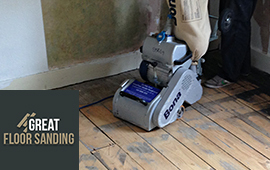 Sanding: You can a precise sanding performance delivered by the stellar machines from BONA. These powerful sanders strip down the wood, keep it completely level and leave almost no sawdust behind – a vital advantage compared to other companies. Staining: You can style your floors anyway you want! Sealing: Whether it’s varnishing, oiling or waxing, we have all sorts of ways to protect your wood with all natural materials. Wood Floor Fitting: For wooden floorings beyond repair and restoration, we are able to install a new floor at your property. The qualified technicians will help you choose the one type that suits best your property. The Best Wood Floor Sanding Company In London – Book Now! Grab the receiver and dial 020 3404 9697! The biggest staple of our service is that we’re always on the line ready to speak with you, whenever you may call. It might be Monday or it might be at the weekend. It can be in the late afternoon or the hours before noon. Our operators work hard to ensure you get optimal in terms of communication with us, and of scheduling. Do you have questions? Requests? Inquiries? Be sure to come to us with anything on your mind. You can also take a look at some of the Areas We Cover.